Pigeons flutter and fly from one boxed-off cubbyhole to another, up and around Marcel Letellier’s head as he enters the coop. About the size of a large shed, the structure is cramped and confined inside, its already limited floor space sectioned into compartments by walls, screens, and doors. The floor is littered with sawdust, feed, and the droppings of this place’s prized dwellers. 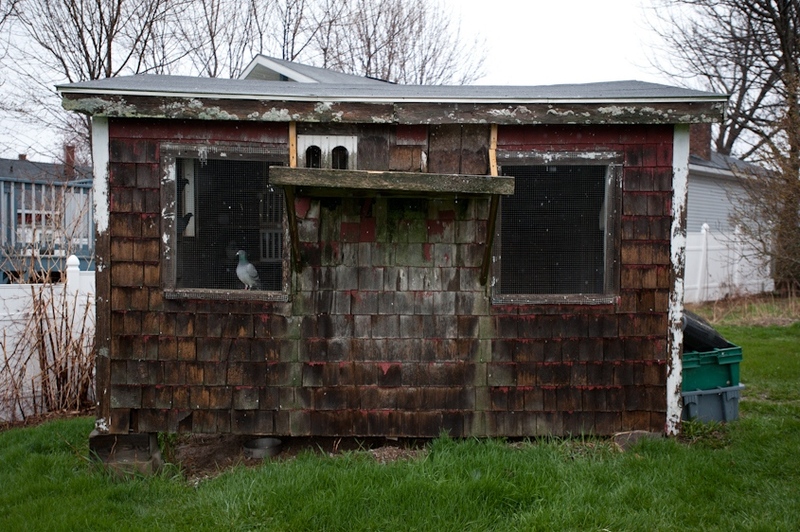 The coop is one of three that dot Letellier’s backyard in Biddeford. Letellier places both big, wrinkled hands into a cubby, pulls out something quivering and quiet, and then lifts his top hand to display a wet, yellow-pink hatchling. The young pigeon shivers in the cold spring air. 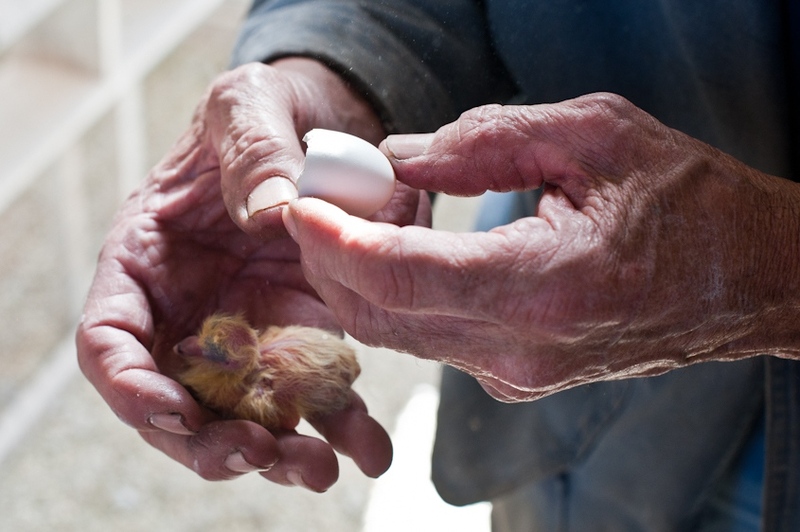 A hen, the hatchling’s mother, peers sideways at the human, fussing until her baby is put back underneath her light gray belly. Neither the acrid smells of animal waste nor the keyed-up birds seem to faze Letellier. The coop is his space, too. This is where much of the work of pigeon racing is done. Columba Livia, known commonly as the carrier or homing pigeon, is capable of locating the correct direction of its nest and returning to its roost from hundreds of miles away. 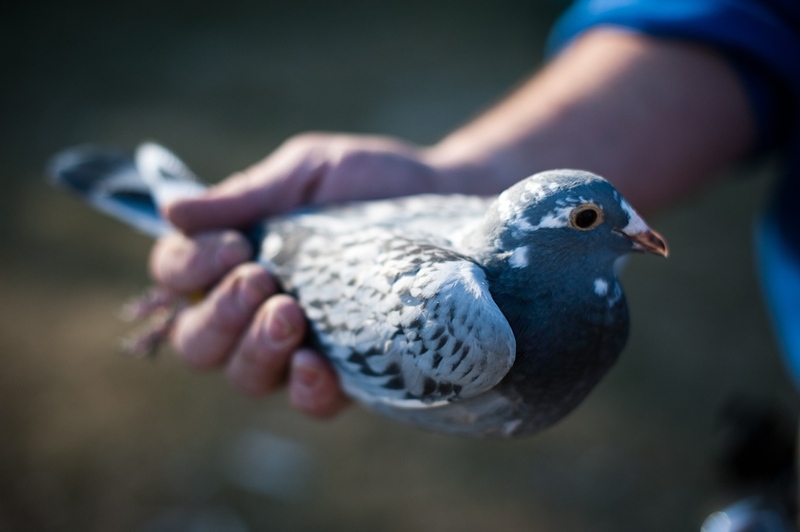 People have been taking advantage of homing pigeons since as far back as the fifth century BC, when they were used as messengers in Syria and Persia. Yet an explanation for the birds’ remarkable talent remains mostly a mystery. 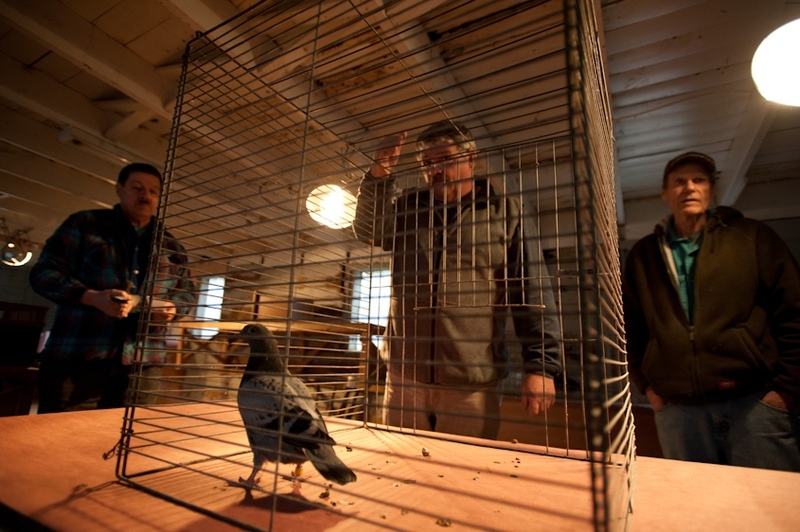 Outside the coop, Letellier and his son, Jeff, both members of the Biddeford Racing Club, explain that although pigeon racing has recently gained some notoriety in popular culture — Mike Tyson starred in a reality show featuring his love of pigeons — it is a dying tradition. In 1965 the Biddeford club, one of just three remaining in Maine, had 250 members. Today, it’s down to thirty-five individuals who race their birds every Sunday from May to September. As father and son chat, it is not so much sadness they express as nostalgia. 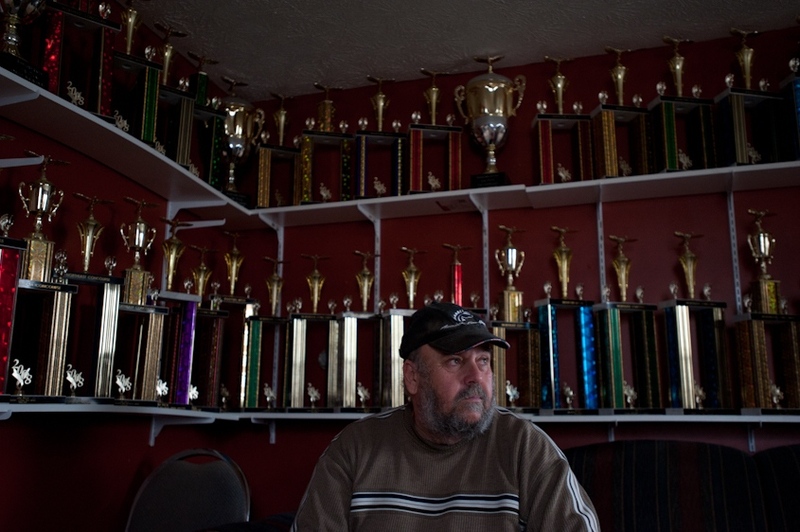 Among the Biddeford club’s members, tales of “war pigeons” abound. Letellier is an expert of this lore. The most famous story, he says, involves a pigeon dubbed G.I. Joe by British soldiers during World War II. Occupying a village in Italy with all lines of communication cut, the soldiers realized they were about to be bombed by their own planes. They sent out their only hope, G.I. Joe, with a message attached to his leg. The pigeon made it to the airfield in time for the commanders to cancel the bombing operation, saving the troops’ lives. Other soldier birds, stuffed for posterity, are displayed in the Smithsonian Museum in Washington, D.C. The conversation turns away from the past to the upcoming races. “We got this one guy and he’s really hard to beat and he loves pigeons,” Letellier says. “Jim Peck. If you beat him, you’ve earned the race.” Jeff nods. It is clear that Peck is the man to watch. He indicates the healthiest members of the flock, pointing to the shiny green and purple patterns that circle their necks. “The shinier the better.” He ruffles his finger through the hen’s feathers and then turns her over and places her back in her box. All the men handle their creatures in the same delicate yet deliberate way. 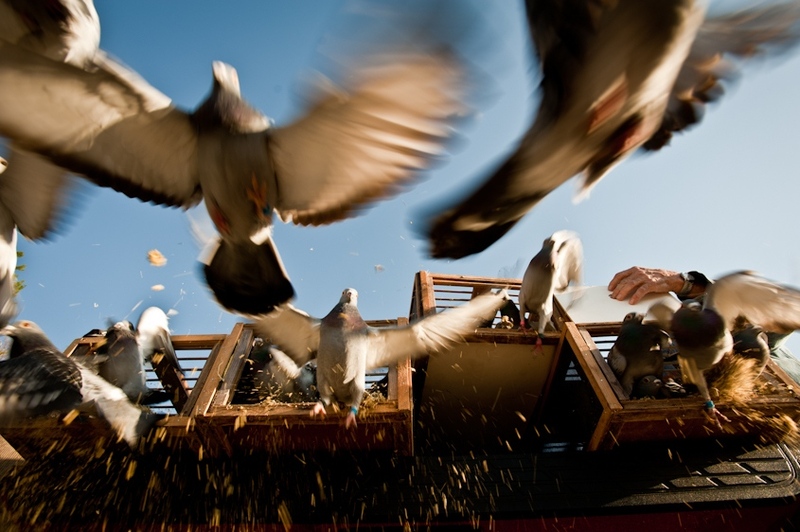 The pigeons don’t struggle, and it is impossible not to note the mutual intimacy that has formed between man and bird. 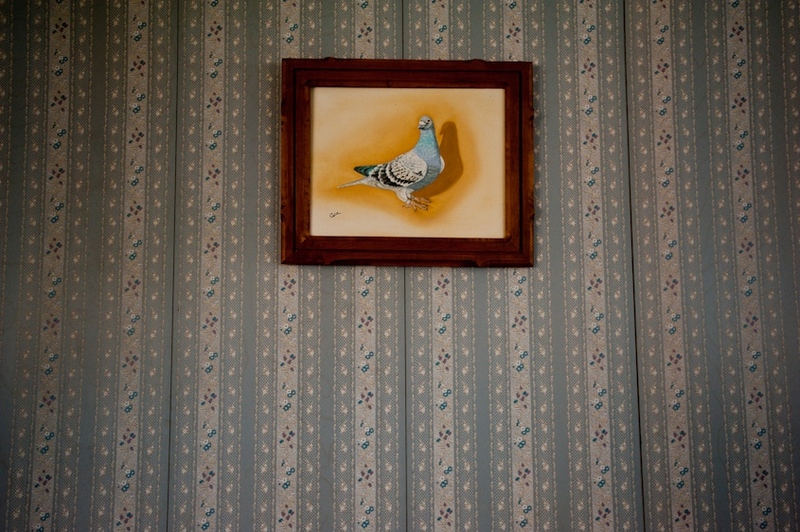 Jim Peck admits he got his start in pigeon racing after stealing two pigeons from Boucher’s coop when he was nine. Since then, Boucher has been fighting to keep up with his protégé. Sitting in beach chairs in the sun on Peck’s lawn, the two send mock insults back and forth and chuckle in a way that only two very old friends can. 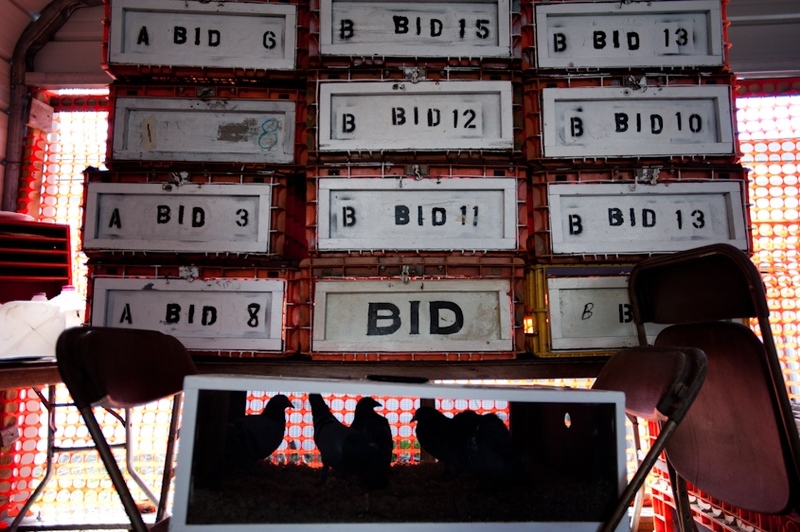 One by one the birds are placed in a cage in the center of the room, and the members place their bids. For the racers, the auction is just another part of the ritual. The hope is to win something extra on race day. “It’s a poor man’s horse race,” one member explains. A few days before the first race of the season in May, Marcel Letellier and Jim Peck wake at dawn, load their peeping crates into a truck, and begin the drive to Lake Winnipesaukee, in New Hampshire, for a practice run. They have been training for months, starting by letting the birds outside the coop and then slowly, day by day, releasing them farther and farther away. From the bluff overlooking the lake, it’s a distance of about eighty miles to Biddeford. The men park the truck on a hill overlooking rays of new sun bouncing off the lake. They ready their crates and check their watches. And they wait. Finally, it’s time. Crate doors lift up and flocks of birds rise, hovering in the space above the lake, backlit by the morning glare. They circle a few times and then a few times more. Some birds lose the group for a moment and then rejoin it. Peck and Letellier shade their eyes against the sun, watching. One flock flies behind the truck before circling back. A group of “commons,” wild pigeons, like you would find in a park, flies by, and Peck momentarily worries they will distract his birds from their goal. Soon, though, all the racing birds have disappeared into a blue sky, and the men pack up and drive home. The day before the race, every racer’s birds are collected at the clubhouse on Jim Peck’s property. They are separated out and tagged with little magnetic rings placed around their legs, then crated randomly and stacked up into a trailer. The racers have hired a truck to transport the birds to the starting point 150 miles away and release them at dawn. The members can’t make the drive themselves because the birds would beat them back, and watching the birds arrive is what the sport is all about. The men will sit and watch as the pigeons fly to their own personal roosts and walk through hatch doors. The doors are rigged to record each animal’s flight time. Then the results are brought back to the clubhouse and compared. The starting point, near Burlington, Vermont, is a new location and some members are concerned about the change. It might confuse the birds. Some of the pigeons will have to fly around mountains that could cost them significant time. Butch Boucher tells stories of birds that go missing for days, weeks, months, and then one day appear back home, as though nothing was wrong. Marcel Letellier is calm about it all, though. He trusts he has done all he can do and knows once the pigeons are packed up, their fates are out of his hands. The next morning, Jim Peck is in his coop counting birds, and it’s clear he is nervous. All the time and work he has put in comes down to this day. The first race is also a good sign of how his flock will fare all season. It’s partly cloudy with little haze — good for both flying and searching the sky. But some in the crowd that has gathered on Peck’s lawn whisper that they heard reports of bad winds, which could mean trouble for the pigeons. It’s 9:30 in the morning. The birds should begin appearing around ten. Everyone searches the air. Some use binoculars. A friend of Peck’s spots a black speck high up. Just a crow. Peck leaves the coop and takes his seat among the other men. 10:30 a.m. rolls by. 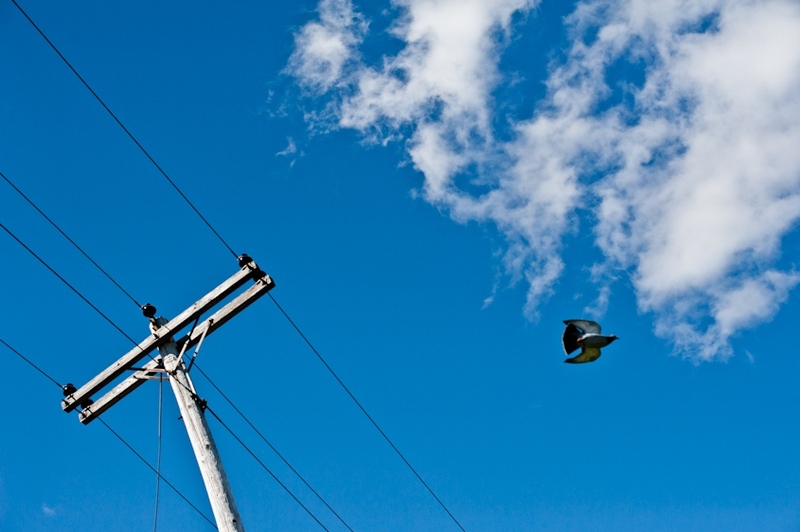 A common pigeon perches on a wire over the yard, and Peck gets up to scare it away, fearing it will confuse his carefully trained thoroughbreds. Peck tells a story of spotting birds way high up in the sky and then watching them plummet down and swoop into the hatch door. He also describes once watching a red-tailed hawk maul a pigeon right above his house. It’s almost 11 a.m. now. Peck is unsettled and asks everyone to be silent. His head is cemented upward; his eyes stare at the sky. Past the lawn, past the river, past the red-bricked town in the distance — somewhere out there in the open are his birds, searching only for the snug safety of their familiar cubicles. And Peck waits, peering out into the big blue sky, just like last year and the year before that, waiting for his loyal little creatures to come home.